We had an epic day Penguin Spotting yesterday and were all absolutely shattered. It’s also approximately 30 degrees today and none of us are coping well with the heat. The older two boys made a list at the start of the summer holidays and I jumped at the chance to take them to the cinema today to enjoy the air conditioning! Nice for Mark and Loki to have a bit of Father/Son bonding too. I had to wake Oren several times, even after breakfast he gave up and curled up with the dog on the sofa! Still totally done in from yesterday bless him. I checked the cinema times and the three of us arrived nice and early, even ticked off another penguin on the way! We had taken Mark’s car because it had air conditioning but as it turned out the heat was just too much so we had all the windows down panting all the way into Dundee! Due to a glitch on the Cineworld site the wrong times were being shown and we’d missed 10 minutes of our intended film so we didn’t let it bother us and we opted to see something else. We had an additional 20 minutes to wait so I decided to move the car to under a tree to stop it from melting in full sun! Several other cars were doing some reverse parking shenanigans so I waited very Britishly along with the others and when I got waved on to go by the car adjacent to me and rather spectacularly reversed straight into a truck. Totally my fault. I should have double checked before I went. 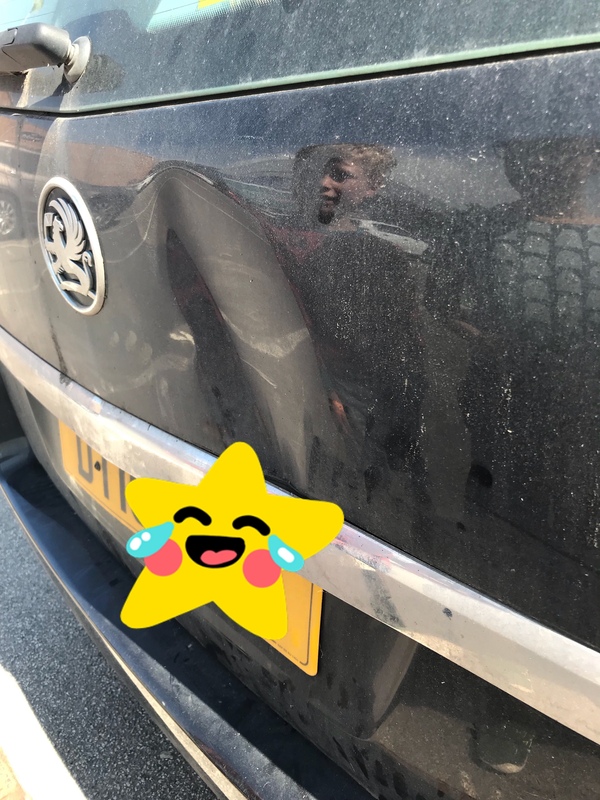 I haven’t had a bump in my car since I passed my test and I inadvertently rammed a Police Officer at a motorway roundabout in my Mum’s car when she panicked and decided to swap lanes and slammed her breaks on… but that’s another story! Thankfully no one had any injuries to speak of. Edward helpfully pointed out I’d hit something and Oren added he was glad it wasn’t a dog! Thanks boys! The truck I hit didn’t have a mark on it but Mark’s boot has sustained a fabulous new dent! The truck driver said he felt terrible as he’d seen me get waved on and tried to stop… my fault whichever way you look at it. Never mind! So we parked under a tree and headed back into the cinema. The ticket steward ripped the part of our ticket that had the screen number on right off and the display screens weren’t on in the foyer so after grabbing some popcorn I checked where to go. A rather grumpy Cineworld employee sighed and pointed to screen 4 so off we went. 40 minutes of truly terrible adverts, 2 bored to tears boys with bellies full of popcorn, the film finally started… Mamma Mia… it was not the right screen! Legged it out of the cinema and found the nearest employee that looked like they knew what they were doing and found the right screen. We got subjected to a further 10 minutes of trailers before it actually started but the three of us all thoroughly enjoyed Incredibles 2. Another holiday activity ticked off the list! It was even hotter when we got outside so we distracted each other from the heat and discussed our favourite bits of the film. Mark’s car got serviced and its MOT earlier this week and before I left he said the handbrake has been adjusted so don’t pull it all the way up. Again, thankfully, there doesn’t appear to be much damage on our cars. So the boys have learnt some new swear words today and I have learnt to trust no one; do not rely on British etiquette and turn taking, never trust a grumpy Cineworld employee and I’m not even sure I should trust my husband after today! In addition, I clearly shouldn’t trust myself either! We had a lovely holiday; the funniest day was watching Mummy crash the car twice and shout at a tree outside the cinema!